Victoria's Cottage maximizes the living space in a classically styled small house. If you haven't yet seen the photos, drawings and description of the house, click HERE. 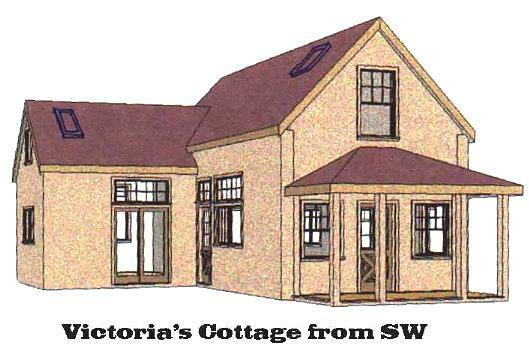 Floor plans for the fully expanded cottage with porches, additions and extensions. How to Read Plans - Structural notes, symbols and abbreviations. Foundations and Soil Types - Includes additional information on building the post and pier foundation. Please note: The full Victoria plan, with the bedroom addition and kitchen pop-out is not a house for a first time builder. It has some large exposed beams and a more complex foundation plan than other CountryPlans houses. The 16' x 28' expandable studio house (included in the set) is simple to build, but the full Victoria is a rather custom home and some of the handsome projects shown in the photos and on the Gallery were built with professional help with both local plan modifications & construction. If you are planning to build an inexpensive owner-built house and this is your first house, a better choice would be one of the simpler 20' wide cottages.